Renewable energy is gaining momentum, but big oil companies continue to cut exposure to these new energy sources. The reason why might surprise you. The writing is on the wall for big oil companies. Renewable energy is now cheaper than energy from fossil fuels in places with an abundance of sun or wind, and with costs falling, it won't be long before it's cheaper just about everywhere in the world. At the same time, the appetite for oil is waning in developed parts of the world. The U.S. and the European Union are in the midst of a long decline for a number of reasons, from higher prices to more efficient vehicles. 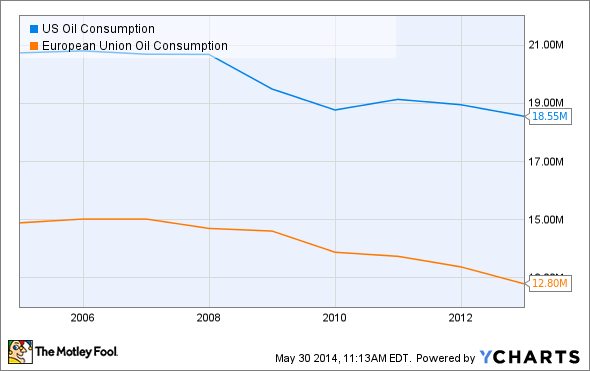 US Oil Consumption data by YCharts. This data isn't new to big oil, and they know the long-term threats facing their industry. So, why can't they adapt and evolve to the energy industry of tomorrow? It isn't as if big oil doesn't see renewable energy coming. BP (NYSE:BP) changed its logo to look more "green" and, until fairly recently, had its own solar panel business. Chevron's (NYSE:CVX) renewable energy business that focused on geothermal plants made a $27 million profit last year. Huge projects like this are where big oil can invest in renewables. Source: SunPower. But both BP and Chevron shut down these renewable energy businesses to focus on fossil fuels. They see the problem, and they know there's a solution, but executing on it is harder than it seems. This is something we see time and again as industries are disrupted by new technologies. It isn't like Walmart didn't see the Internet coming, or Kodak didn't think digital cameras had a future. The problem is that they don't know how to evolve from what was and is a profitable business to a business that will one day be the future. Changing business models and cultures is great on paper, but very few companies can do it successfully -- big oil is no different. In solar, it's particularly difficult. I recently asked SunPower's (NASDAQ:SPWR) investor relations vice president, Bob Okunski, about the prospect of Total (NYSE:TOT), which owns 66% of SunPower, buying out the solar company. He said that more than anything, Total might not know how to run a solar company. Residential solar is providing huge value for installers like SolarCity and SunPower, but big oil has almost no exposure. Source: SolarCity. When Total bought its majority stake in SunPower in 2011, executives came to the U.S. to meet with management and learn more about the company. Total's executives asked to see a 10-year plan, something that big oil us used to outlining both internally and to investors. But no such plan existed at SunPower because the industry changes so quickly that the plan would be obsolete within months. This fast pace suits a smaller company like SunPower or SolarCity, but it's foreign to a company used to making decade-long investment decisions. None of this means big oil can't and won't somehow invest in newer forms of energy. They can buy projects that will generate revenues for years to come and just hold them on the balance sheet, something Total is starting to do. The YieldCo has also become a popular wind and solar investment, allowing companies to bundle projects into a single investment vehicle. Big oil is used to invest in projects that have 20+ year revenue potential, so these would fit well in their portfolios. As for manufacturing solar panels or any other components, I think that opportunity has passed. Big oil isn't nimble enough to be in the technology of renewable energy; it has proven that time and again. Instead, that will be left to smaller, more focused companies, and big oil may play in the market by buying projects, which doesn't come with the same upside for investors. At the end of the day, big oil hasn't found a way to invest in renewable energy and shape the market, which is a theme we've seen seemingly dominant companies in industries over and over again when disruptive technologies are introduced.